The study of creative, diagnostic, visual, spatial, analogical, and temporal reasoning has demonstrated that there are many ways of performing intelligent and creative reasoning that cannot be described with the help only of traditional notions of reasoning such as classical logic. Understanding the contribution of modeling practices to discovery and conceptual change in science requires expanding scientific reasoning to include complex forms of creative reasoning that are not always successful and can lead to incorrect solutions. The study of these heuristic ways of reasoning is situated at the crossroads of philosophy, artificial intelligence, cognitive psychology, and logic; that is, at the heart of cognitive science. There are several key ingredients common to the various forms of model-based reasoning. The term �model� comprises both internal and external representations. The models are intended as interpretations of target physical systems, processes, phenomena, or situations. The models are retrieved or constructed on the basis of potentially satisfying salient constraints of the target domain. Moreover, in the modeling process, various forms of abstraction are used. Evaluation and adaptation take place in light of structural, causal, and/or functional constraints. Model simulation can be used to produce new states and enable evaluation of behaviors and other factors. 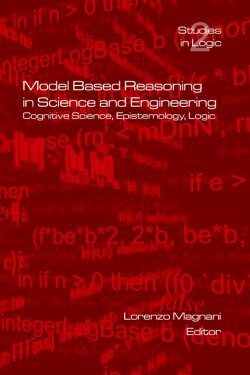 Several of the papers in this volume aim at increasing epistemological knowledge about the role of model-based reasoning in various scientific tasks, other papers address fundamental cognitive issues related to model-based reasoning and illustrate novel analyses of cognitive �logical� models of model�based reasoning and of the interplay abduction/model-based reasoning/creative inferences. The volume is based on the papers that were presented at the International Conference Model-Based Reasoning in Science and Engineering: Abduction, Visualization, Simulation (MBR�04), held at the Collegio Ghislieri, University of Pavia, Pavia, Italy, in December 2004.